Staples Inc. is a large office supply chain store, with over 2,000 stores worldwide in 26 countries. 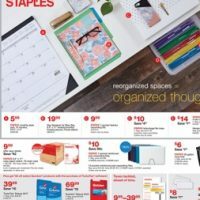 Based in Framingham, Massachusetts, United States, the company has retail stores, serving customers under its original name in Australia, Austria, Brazil, China, France, Germany, India, Italy, Norway, Portugal, the United Kingdom, and the United States, while operating subsidiaries in Argentina as Officenet-Staples, Netherlands as Staples Office Centre, Canada as Staples Canada (Bureau en Gros in Quebec), and in Italy as Mondoffice. 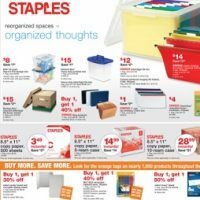 Staples also does business exclusively with enterprises in the United States and multiple European countries as Staples Advantage. By 2001, Staples integrated its e-commerce website to all of its subsidiaries across the world. In 2002, Staples launched Staples Foundation for Learning and acquires Medical Arts Press, which became part of Quill Corporation. By 2004, Staples expanded to Austria and Denmark and in 2007, Staples opened its first store in India. 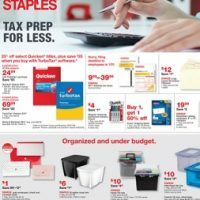 In 2008, Staples acquired Dutch office supplies company Corporate Express, one of the largest office supply wholesalers in the world. 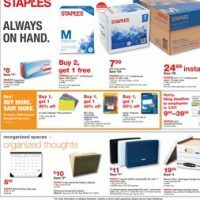 Staples also launched 11 concept stores in the New England area featuring a large focus on small business and technology related services. 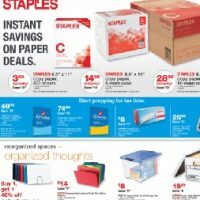 On iWeeklyAds you will find the latest Staples weekly ad and weekly circular, online, on a single place.